Hellooooo long hair! I currently feel like a combination of Rapunzel/Barbie/Nicole Kidman in the Stepford Wives (all in a good way of course) thanks to my new tape-in extensions. I’ve been getting them done for the last eight months and really have loved my experience. It’s been a lot of fun having so much more hair to play with and style. So why did I get them? To be honest it was mostly curiosity (I’d been intrigued since high school!) but also because you guys know I love braiding. My extensions give my hair added thickness, slight length (mine are about an inch longer than my own hair) and brighter blonde highlights. My goal wasn’t drastically change how I look, but to just enhance my own hair in a way that still looks natural. It’s important to point out that Fourteenjay is an Aveda salon and they specialize in doing color. I adore Aveda hair products so this was a BIG bonus for me. I love knowing that every product used on my hair is naturally formulated with organic ingredients. So who do I see? Michelle does my highlights and from the get-go she’s prioritized the health of my hair. Over the last two years she’s gradually lightened my blonde in a safe way vs just aggressively bleaching me to my current shade, which likely would’ve damaged my hair. 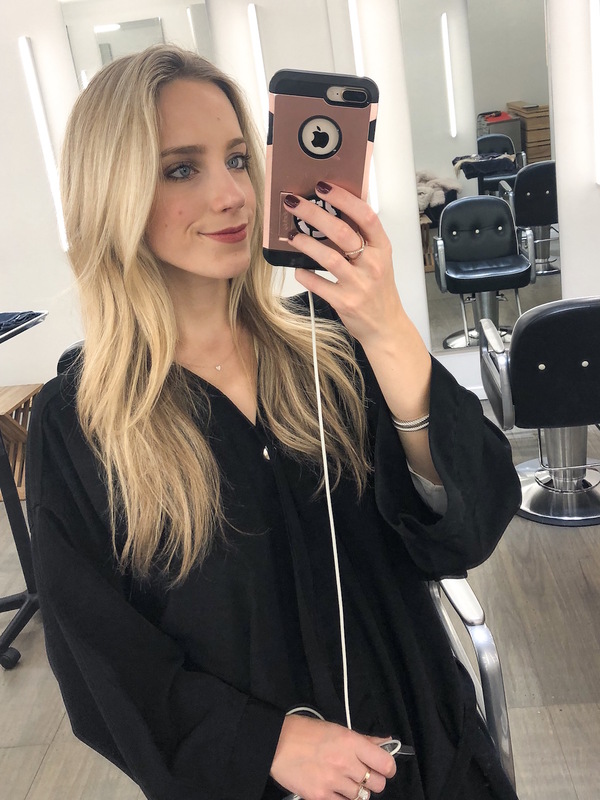 She’s AMAZING at doing blonde color and worked with Heather to decide on what shade of extensions to order to match my hair best! Heather has my been go-to gal for styling and now she does my extensions. My top hair goal over the last three years has been growing my length and I really appreciate how Heather has never tried to pressure me into chopping it (as I’ve experienced at other salons.) Heather was the one that explained the extension process to me and ultimately convinced me to give them a try. She was awesome at answering all my questions and fully explaining details on the cost and maintenance. 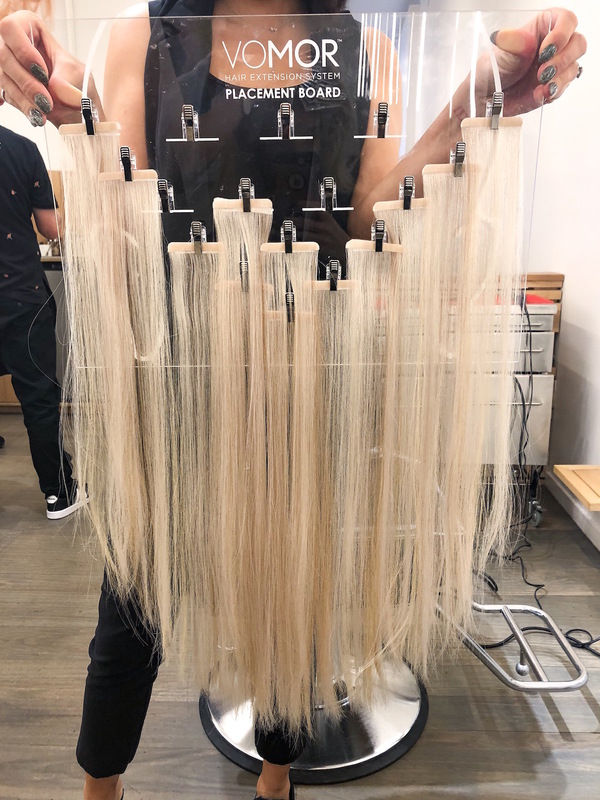 + Vomor extensions are exclusively made from cuticle intact Remy hair, collected and manufactured in a humane manner, and packaged according to environmental guidelines. + Recommended wear is 6-8 weeks and panels can be re-sued up to 3 times. + Available colors: each length is available in 30 colors ranging from ash blonde to deep black. ^^ Here you can see the size of each extension panel– I get 12 total! Each box of Vomor extensions contains 6 panels of hair. 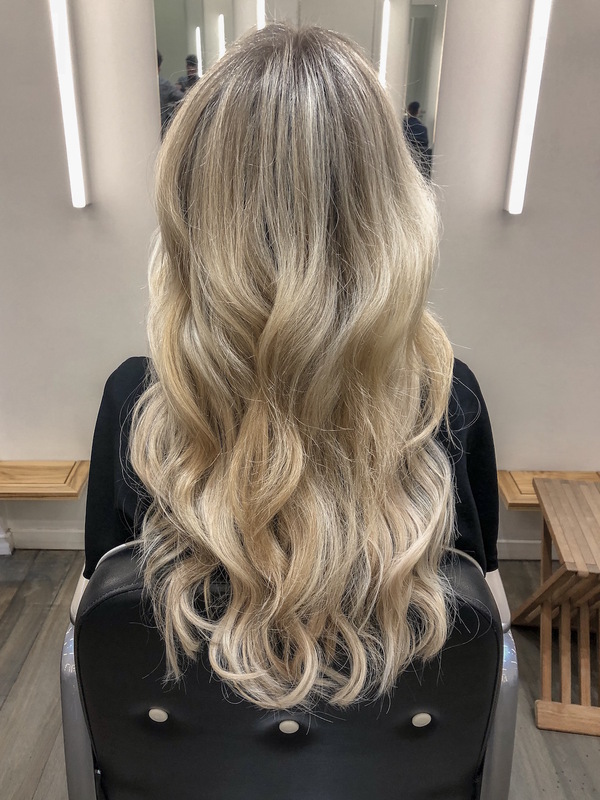 Since Vomor extensions can only be purchased by salons, your stylist will work with you to decide what shade of extensions will best complement your own hair color. At my last appointment I used 12 panels, so two total boxes of extensions. I LOVE how Heather ordered mine in two slightly different shades (I use Aveda 8N/10N & Aveda 12G). This was done to naturally match my highlights, but also to avoid that one dimensional obvious solid color look. Curious how the extensions are installed? It’s incredibly quick, easy and pain-free. The top of the extensions are pre-coated with a medical-grade adhesive tape that your stylist will place at the root of your hair. The adhesive is literally the same as what’s used in hospitals to close wounds– it’s seriously strong stuff. From the moment your extensions are taped to your hair, they WILL NOT BUDGE. Literally the only way these can get detached from your head is if you rip out your own hair that the extension is taped to. ^^ These photos were taken after 7 weeks of wearing my extensions– take note of the inch of growth between my root and where the extension was originally adhered. The removal process is easy as well. 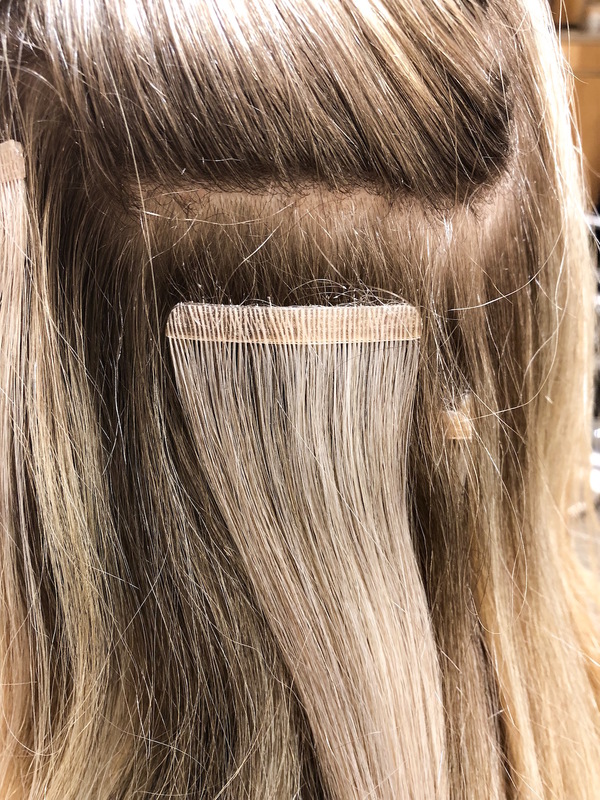 The adhesive strip at the top of each extension gets sprayed with a solution that instantly dissolves the tape, allowing each panel to be safely combed out of the hair. Next the panels are washed, given a conditioning treatment and then blown dried. Each extension is then resurfaced with a new adhesive strip so it can get placed back in my hair that’s also been washed, cut and blown out. All of this happens at the same time over the course of two hours. If I get my color done at the same time then my appointment will take 4+ hours. 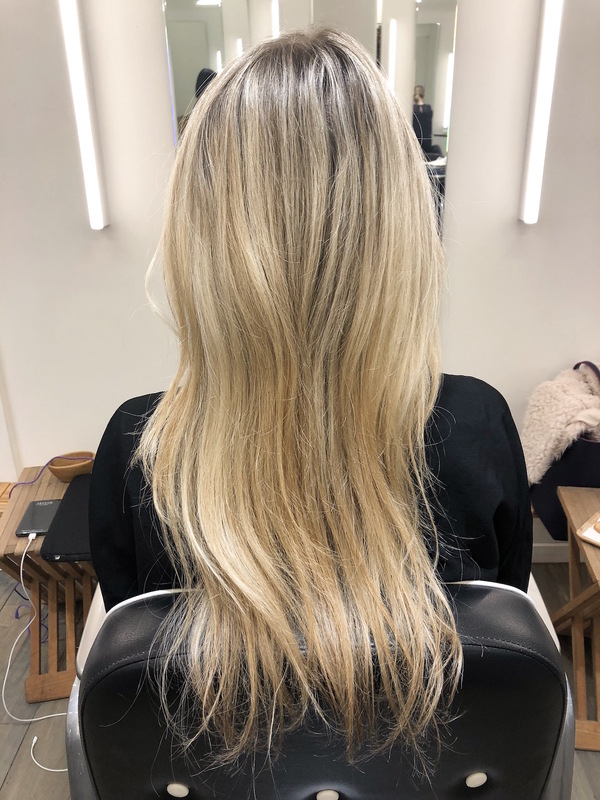 I personally find the in-salon maintenance for my extensions to really simple/hassle-free (I usually bring my laptop to work) though it does require regular appointments every 6-8 weeks. I’ve found that I’m able to use my extensions up 3 times and can go 7ish weeks between appointments. Keep in mind that everyone’s salon visits are going to be different based on how fast their hair grows and how well they care for their extensions. As your natural hair grows, the extensions will grow with them and eventually there will be a gap between the root of your hair and where the extensions were adhered. ^^ And now here it is with extensions! If your hair grows fast, you’re likely going to want your extensions repositioned sooner than someone with slower hair growth. Heat causes damage to extensions just like normal hair, so if you’re doing a blow out/curling/straightening every single day the quality of your extensions will deteriorate quicker and you may only be able to get one or two uses out of them. So those are just the costs for the actual box of extensions. 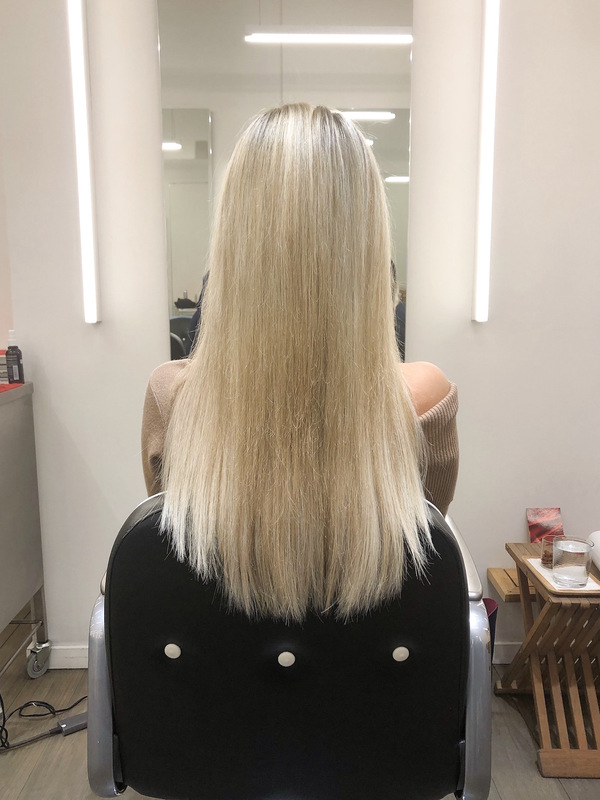 You also then have to add in the fees your stylist will charge for installing, removing and resurfacing the extensions (if you decide to use them more than once.) These fees all vary depending on the amount of time required to do this work too. If you only have six panels of extensions that take 30 minutes to install/remove, your service pricing will be less than someone who has 12+ extensions whose service takes an hour or more. Your first appointment will be the most expensive since you’re paying for the actual extensions on top of the install and styling fees. If you decide to reuse your extensions at latter appointments, you’ll only be on the hook for styling, install and resurfacing. 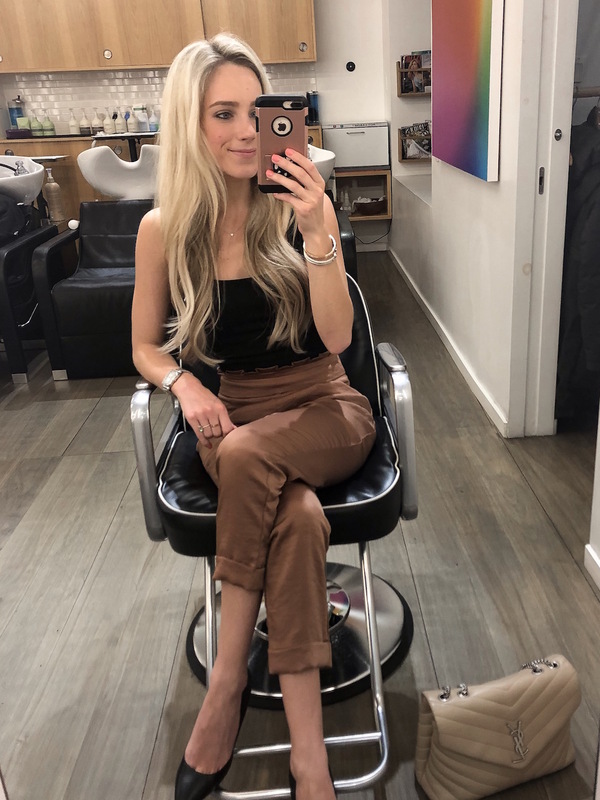 If you’re seriously considering getting extensions, I highly recommend calling your salon and setting up a consultation. This way they can walk you through the exact pricing and give you a clear picture about what you’d be investing. How often do you have to have the extensions maintained and adjusted? I go every 6-8 weeks. It all depends on how fast your hair grows as the extensions will grow out with your own hair. Did you get extensions due to hair loss? Nope, I actually have pretty decently thick hair. For years I had wanted to try extensions solely out of curiosity (thanks America’s Next Top Model!) but more recently because of my love for doing intricate braids. Anytime I’d braid my hair I’d have to use a bunch of clip-in extensions (which are a great easy way to add thickness to hair) but I wanted to try something more permanent and natural looking. Can I get long extensions if I have short hair? Of course. One of the top reasons people get extensions is to add length. If you get them installed by a great stylist, they’ll be able to blend and place the extensions in a way to naturally incorporate with your shorter layers. Have you noticed any hair loss or damage from the extensions? Nope. Tape-in extensions are the safest extensions you can get and won’t cause any damage to your own hair as long as you take care of them and brush gently at your root. Can you feel the extensions? Do they hurt? I can feel my extensions when I run my fingers through the roots of my hair, but it’s not a feeling I notice just going about my daily life. The reason tape-in extensions are so popular is because 1) they are incredibly lightweight and 2) they’re pain-free and literally just adhere to your own hair. There’s no braiding, bonds or beading involved, all of which can cause hair loss and discomfort to the scalp. Can you wash and dry your extensions like you normally would your hair? Yes! Extensions are made from real human hair so you wash them in the same way as your own. The only difference to my shower routine is I’m much more gentle when I go to scrub and wash my scalp/roots. After showering I like to let it air dry about 75% of the way before casually going through it with a dryer + flat brush. I then will curl my hair like normal with a 1.5″ round iron. The only downside I’ve found with my extensions is my hair takes much longer to dry and heat style. Luckily I can get away with washing it only 1-2x per week so it’s not too much of pain! My hair is very fine and thin. Could I still get extensions? Definitely. Extensions are a great solution if you’re looking to add volume to thin hair or if you’re suffered from hair loss. 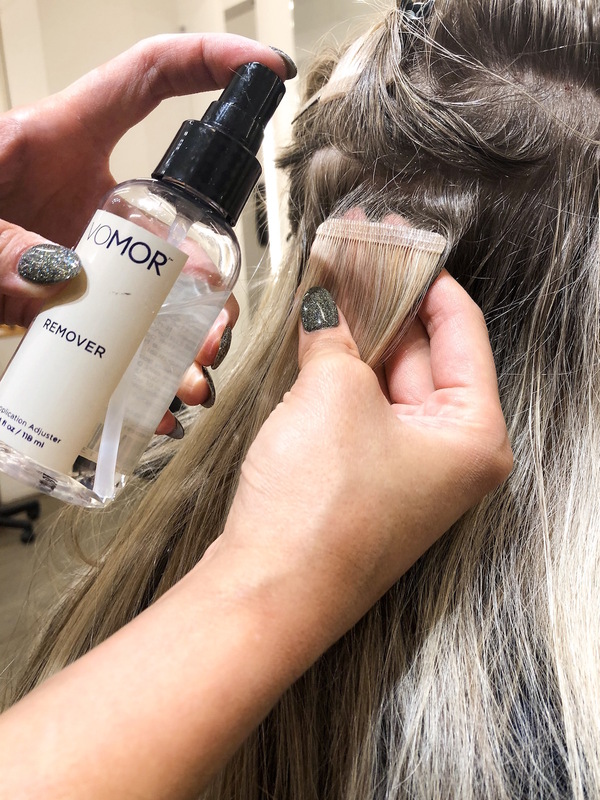 Vomor extensions are lightweight and the adhesive tape is very gentle/easy to remove in the salon so these are a very safe option for those with fine, thin hair. Can you wear you hair in a bun or updo with extensions? Yep! I do all the time. It can just get a little tricky after a few weeks because there will be a gap in between your root and where your extensions are adhered to your own hair. I can totally still do a top knot, but it does take me slightly longer than if I wasn’t wearing extensions. 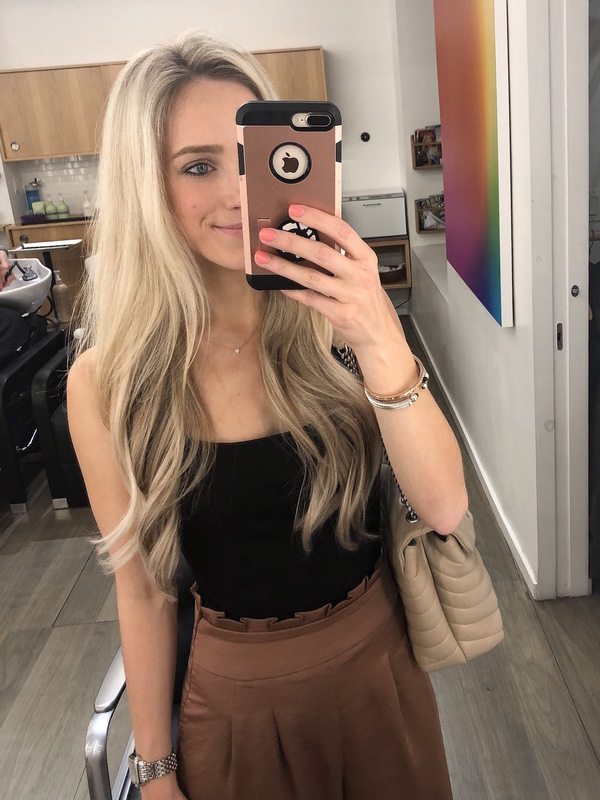 This is a reason why it’s SO important you get them installed by an experienced stylist who knows how to strategically place your extensions so you can style your hair like usual. In both of these photos I had extensions and easily was able to style my hair in a top knot! How do you brush your hair with extensions? The same way I do without extensions except I’m much more careful around my roots. Here’s the brush I use to prevent breakage and hair loss! Thoughts on permanent extensions vs clip-in extensions for a wedding? 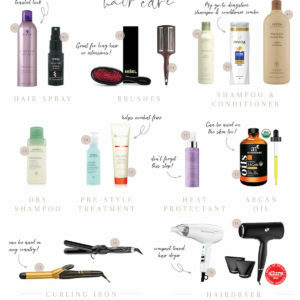 I think it all depends on how you’re styling your hair. If it’s just for added thickness in a updo or braid, then I don’t see why clip-ins wouldn’t be sufficient. I’d just make sure you hire a good stylist, do a practice glam session and wear your hair in the way you plan to for your wedding over an entire day so you can feel confident they’ll stay put. It’s also important to keep in mind that you want to look like the best version of yourself on your wedding day. 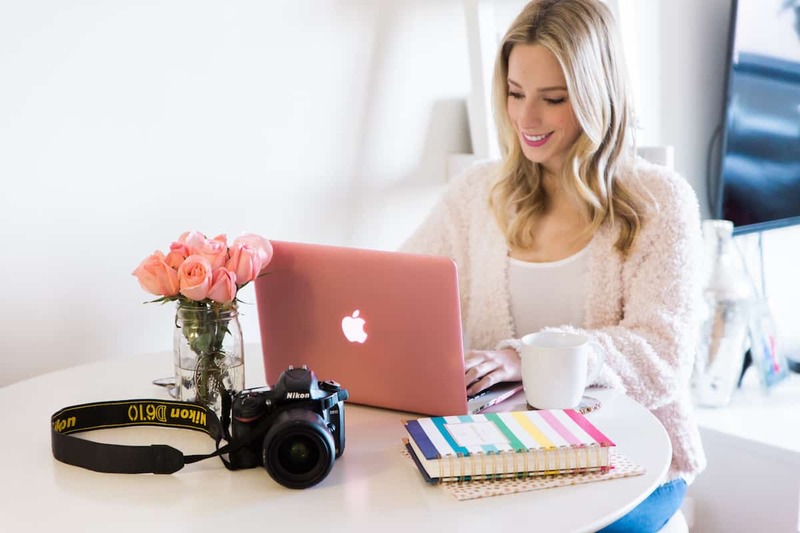 In the months and years following your wedding, you don’t want to look back at photos and feel like you’re seeing a completely different person. I’m clearly all for permanent extensions, but if it’s something you’re considering doing just for the month of your wedding, maybe think twice before going for a drastically longer length or totally new color. What happens if your natural hair dries curly but the extensions remain straight? Good question! While my own hair dries naturally wavy/slightly curly (depending on humidity) my extensions tend to dry smooth with a very slight wave. Luckily the difference isn’t incredibly noticeable, but for the sake of consistency I like to blow out my hair with a flat brush once it’s about 75% air dried. I had been intrigued by extensions since I was in high school, but never considered actually getting them until going to Fourteenjay. Extensions are a big investment, both financially and in the time required for upkeep. I probably would have never pulled the trigger on getting them if I hadn’t found a stylist and salon I trust. So were my extensions necessary? No. Of course not. I honestly got them of curiosity and a desire to braid my hair without having to deal with clip-ins. I have so much fun with my extensions and definitely plan to continue getting them up until our wedding next October, but I don’t think this is something I’ll do forever. It is a big commitment and certainly in my case, it’s a vain one. That said, extensions can be a life-changing solution especially for those with hair loss or naturally thin hair. The best part about them is you can get as many or as little extensions as you want, all at any length you please. 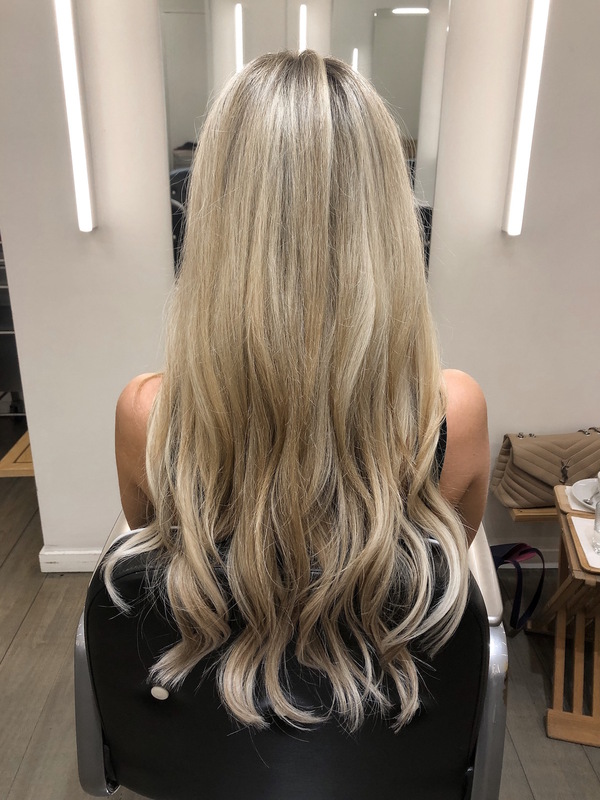 Extensions can be a great way to increase thickness, add length or give yourself platinum blonde highlights without having to color your own hair. No matter you’re reasoning for considering them, I can’t recommend Vomor or the gals at Fourteenjay enough. You look gorgeous! I bet all that hair is really fun to play with for wedding hairstyle ideas! For my wedding I grew my hair out long so I could do any updo I wanted and it was such a good decision. Love all that hair! It looks gorgeous! I would have never thought they were extensions. What a perfect job and color. Would you be willing to take a pic from the back with your top knot?! I had very high quality tape ins but could never pull off a high pony or top knot. I’m so jealous and need to figure out if it’s user error or something I need to talk to my stylist about. Thank you! Looks so pretty, l have thought of trying since my hair is thinning now because of my age. Yours are so pretty and well done, my friend just graduated and does extensions and l thought about trying before my next trip. 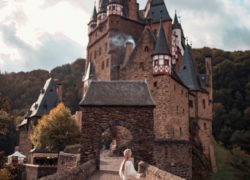 How far in advantage should l plan before trip? 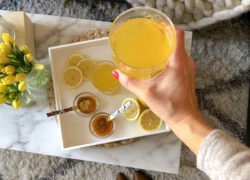 Thanks, love your blog posts and tips, Recently sent blogger from California your blog information on what to pack for New York,she traveling this weekend. Have a great day. Love to travel myself, hoping to take my daughter to New York this Summer for her first trip.Loved your tips from your recent trip it looked like amazing experience. Congrats on your upcoming wedding plans. That’s exciting and fun time of life.Prayers and blessings,it can also be stressful. Enjoy this time it only happens once.